Mood board: David Bowie’s Rebel Rebel was the opening song played at the luxury leather house’s A/W 2019 show (the singer is becoming Milan Fashion Week’s favourite singer – Heroes was also played at the finale of Fendi’s show, in an ode to Karl Lagerfeld). And while its accompanying look – a belted leather trenchcoat paired with a rollneck – had 1960s appeal, its collection was rooted in contemporaneity. This was an offering imagined in black and tan, with pops of forest green and raspberry and hints of leopard print. Leather has been the season’s key fabrication, just look to Bottega Veneta and Chalayan. It was used here in mannish staples like double-breasted blazers, knee-length shorts and seductively slashed patent pencil skirts. 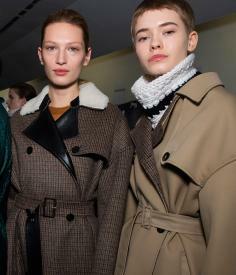 There was interplay between strength and comfort, seen in the sporty outerwear, and chunky knit patterned cardigans. Best in show: That twist on tradition was conveyed through smart coats, which appeared classic face-on, but had down-filled, padded details at the reverse. Confidence came in the insouciantly styled ensembles, like a leather knee-skimming skirt paired with a snowy ribbed jumper and loafers.